Two hundred years ago, building a two-mile macadam road was a daunting task. Today, it’s not a problem because of Eli Whitney Blake’s stone crusher. Born in 1795 in Westborough, Mass., Blake had the family talent for creative thinking and devising innovative solutions to challenging tasks. His father was a farmer, and his uncle, Eli Whitney, invented the cotton gin. Blake attended Yale University and graduated in 1816. Following graduation, he pursued a law degree at the Litchfield Law School. During his second year at Litchfield, Blake was summoned by his uncle, Eli Whitney, to help him expand his arms factory near New Haven, Conn., along with Blake’s brother, Philos. After his uncle’s passing, Blake and his brother took over Whitney Armory until 1835. That year, Blake and his brother, along with another individual, John, started a factory of their own called “Blake Brothers.” The factory made door locks, latches and other domestic hardware items. This company was the first in the country to introduce “mortise” door locks and latches. The process was not easy, though. It began in 1851, when Blake was appointed by a committee for the town of New Haven, Conn., to construct a two-mile macadam road. A task like this had never been done before. Made of evenly broken stones compacted together and layered with a coating of binder, macadam roads, at the time, could only be created by hand with hammers and had to be smoothed over by travel. 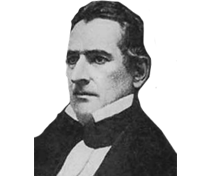 According to “Eli Whitney Blake, Scientist and Inventor” by Henry T. Blake in Volume VIII of the 1914 Papers of the New Haven Colony Historical Society, two days of labor could only produce one cubic yard of road metal. It took three years before Blake devised the idea of the stone crusher. He concluded the machine would require “a pair of upright jaws converging downwards,” according to the papers. Blake received the patent for his crusher on June 15, 1858, but by the time he had constructed the machine, the patent expired. Without the exclusive right to manufacture the machine, others had begun to take the stone crusher to market. This didn’t change the machine’s identity as a “Blake crusher,” though. “All of these machines are generically ‘the Blake crusher,’ and are so recognized by engineers and experts all over the world,” says Henry T. Blake. He goes so far as to say the terms “jaw crusher” and “Blake crusher” are synonymous. In 1872, Blake applied for an extension of his patent. At the time, the law required those applying for patents to submit the labor costs and value of the invention to the Commissioner of Patents for the U.S. Patent and Trademark Office. When Blake applied for the extension, about 509 of his machines were in use throughout the United States, so he was able to demonstrate the cost-saving ability of the crusher. Blake didn’t live to see the 20th century, but his impact was felt throughout it, revolutionizing a number of industries. If asked to build a macadam road today, Blake would probably say it’d be a breeze.